We at Servals have developed the hybrid stove in an attempt to conserve fossil fuel and use renewable energy. The focus is on rural energy independence and hence the use of straight vegetable oil alone is considered. Please note, that bio-diesel which is a refined product is not to be used and the stove is not designed to use bio-diesel. The stove uses up to 30 % plant oil and balance (around 70 %) kerosene. In the event plant oil is costly or not available, the stove can function as a high efficiency kerosene stove using only kerosene. Viscosity of the plant oil used is critical for the proportioning of the capillaries. Presently the design is for Pongamia straight vegetable oil, which is comparatively dense oil. Let me try to give you a quick brief on the how the stove works. Please feel free to contact me for more details. Pump a little kerosene into the spirit cup and light it for preheating the burner. Once preheated, apply pressure in the kerosene tank to reach the desired flame. Once the burner top has reached red hot colour, plant oil and water can be pumped. While switching off the stove, first the plant oil and water should be switched off and later kerosene can be switched off. Pressure release valves are provided on all the three filler caps (i.e. 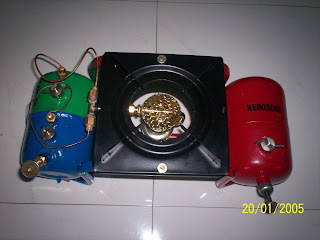 kerosene, plant oil and water filler caps). We have provided a filter in the kit to strain the water and plant oil before pouring into the respective tanks. This ensures that the capillaries do not get clogged / blocked anywhere. We have also made drain provisions for both water and plant oil to clean any sludge/deposits at the bottom. Any blockage of the kerosene vapour nozzle can be cleared using the needle pricker provided in the kit. I will be more than happy to share more details with you if you are interested. Feel free to write to us. We had recently received a test report from Kenya about our Jatropha hybrid stoves. Read more about it here..